No mutual funds are equal, even if they track the same benchmark, and this is also true for lifecycle funds. Lifecycle funds, also known as target date funds, are getting popular among investors who seek optimum asset allocation for their retirement investments. The idea of a lifecycle fund is that the fund’s asset allocation evolves as the fund approaches the target date. With lifecycle funds, investors leave the job of rebalancing the fund’s assets to the fund managers, who will gradually shift the fund’s investment style from aggressive (more stocks) to conservative (more bonds). According to an article in the April issue of Financial Planning magazine, in 2006 alone, financial institutions have launched 50 lifecycle funds. As investors brace for flood of new target date funds, they also have a choice to make: which fund to invest in. In addition to those common factors when evaluating a mutual fund, such as risks, return, and costs, more attention should be paid to the fund’s asset allocation because it’s what makes a lifecycle fund a lifecycle fund. Given any target date, you are likely to find multiple fund offerings. However, their respective asset allocations could be drastically different, reflecting the fund manager’s view on market conditions and the balance between risk and return. 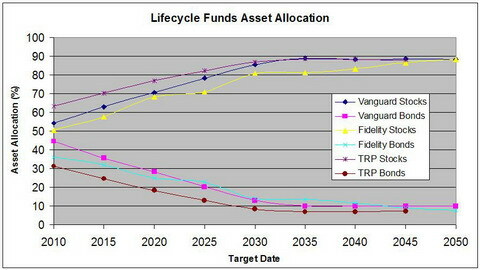 To see how lifecycle funds are different from each other in asset allocations, I took a look at a total of 27 lifecycle funds from Vanguard, Fidelity, and T. Rowe Price, with target dates ranging from 2010 to 2050. The stocks and bonds allocations of these funds are shown in the following plot. Clearly, even with the same target date, the three fund families have quite different views on what should be optimum asset allocation, especially for those funds with close target date (2010 and 2015). For example, Vanguard has 54.2% in stocks and 44.6% in bonds in its 2010 fund, while Fidelity has 50.7% and 35.9%, respectively, and T. R. Price has 63.3% and 31.2%, respectively. In this case, TRP 2010 fund has nearly 10% more in equities than its Vanguard counterpart and a even larger margin over Fidelity 2010. The difference, however, becomes smaller as the fund’s time span gets longer. For 2045 target date, the allocations of stocks and bonds are: Vanguard 88.8% and 9.9%, Fidelity 86.7% and 9.1%, and TRP 88% and 7.5%, respectively. What we can see here is TRP 2035 has more foreign stock holdings that Vanguard 2035 and larger exposure in US stocks than Fidelity 2035. Could this be the difference maker? Like selecting any other mutual fund investments, we also need to consider a fund’s costs and minimum requirement when deciding which lifecycle fund to invest. There’s no doubt that Vanguard is always the leader in providing low-cost investment options, but does not necessarily mean Vanguard funds automatically become the choice. For the above listed funds, Vanguard funds are about 0.5% less in expense ratio (ER), but they lag about 2% in performance as compared with TRP funds. In addition, Vanguard requires a minimum of $3,000 to start investing with them, while both Fidelity and TRP need $2,500 and they both waive the minimum if using automatic investment plan. Are Vanguard Mutual Funds Getting Expensive? Nice article.On a different note I always notice that there are big gaps or blank spaces between paragraphs in your article.I don’t know if you noticed it or not but I wanted to bring it to your attention. Nice coverage on the the life cycle funds. I think alot of people buy into one without really thinking about it because it seems so easy (pick a year of retirement), but just because a fund calls itself something doesn’t make it that as clearly the fund family have diverging views on asset allocation. You simply cannot examine one data point (ie: the performance of three funds at the end of business on a particular day) and declare that it means anything. Why? 1) It occurred in the past – it’s over. 2) The market has somewhat of a cyclical nature. In other words, all other things being equal, you’d probably be wise to pick the worst performing fund going forward – NOT the best. 3) The only thing the investor can control (of the things you mention) is costs. In other words, a low expense ratio should be given a MUCH higher weighting in the decision making process than past performance. 4) One data point is not enough to mean anything – not even close. I could go on, but all of this is investing 101. There is much misleading information out there, and only by reading extensively will an investor be able to separate the good information from the bad. This article, while appearing to be well-meaning, is in the “bad” category. Very bad, IMO. First of all, this article is really about which fund is good which one is bad. In fact, what I want to say is that with lifecycle fund, there are many factors beyond the cost and performance to consider when deciding which one to invest and one particularly important is the fund’s underlying asset allocation. When investing in a lifecycle fund, as discussed in the article, I believe asset allocation is as important as, if not more important than, the fund’s fee. And that’s the main point of the article. The quote in your comments is just my opinion that one doesn’t have to always choose Vanguard fund simply because it has the lowest fees. I agree that fund’s expense plays a crucial role in the decision making process, but if one only considers expenses and ignore all other factors when choosing a fund, Vanguard should be the only fund company that survives because nobody will invest in other funds. However, the true is there are many fund companies out there that are equally successful. As for the data, there are not data of one day, but 3-year average return which happens to be the longest tracking records for all the funds listed in the article. If there are 10-year data available, I will use them to see if I can get the same conclusion. Unfortunately no long-term data is available because of the short history of the funds. While it’s true that past performance doesn’t guarantee future results, we can’t simply discard a fund’s past performance, unless you totally don’t trust any tracking record. Do you look at a fund’s tracking record when evaluating a fund? I am not suggesting that one should only look at the performance. It’s an element of the question, not the element of the equation. And when you pick a mutual fund to invest, do you always choose funds at the bottom of the category as you suggested one should do? If you do, could you please share your holdings with us? I don’t do that and I am not sure how many out there doing that. I don’t agree with you that “The only thing the investor can control (of the things you mention) is costs.” I don’t think an investor can control the cost. You can choose what expense level is acceptable to you, but you really don’t have any control of the cost once you invest in the fund. The fund’s cost will change whether you like it or not. You can only control which one to invest. Speaking of costs, the reason I think people like Vanguard is that it has a proven record of offering funds with low cost. That’s kind of “past.” Do you trust this “past”? Nobody can guarantee Vanguard will never charge 1+% expense ratios for its funds, though it’s unlikely. The same is true for fund’s performance. Nobody can guarantee Vanguard fund’s performance will continue to lag TRP fund for the next ten years, and nobody can say Vanguard will outperform TRP either. Since you said the article is “very bad” but all your comments seem to be on the cost/performance. I like to hear from you what else of the article you consider “very bad” so I can correct it. First I always hear it and for this arguement I am playing devil’s advocate to a degree. With that said I understand you can’t simply look at past performances and that it. In a vacuum and in theory I get that you can’t go on past performance at the end of the day as a main factor for future performance, but then that would be the end of all debate and discussion regarding mutual funds and everything else under the sun for point #1. Which I don’t think can or should be the case. EVERYTHING is a variable and I have yet to come across a solid arguement as to why looking at past returns [in a small percentage of the pie] is a bad idea. Fund A [S&P 500 index] has made 30% a year for 30-years and Fund B [S&P 500 index] had made 1% for 30-years and in that specific case, both are viable options because the performances were “in the past” and we don’t know the future? I would love if someone could explain in some detail how the average investor should NOT be concerned with my scenerio. I agree with you that though we can’t rely on past performance to predict what future may look like when it comes to a fund’s return, I feel historical return does play a quite important role in fund evaluation because that’s only what we have. If we totally discard a fund’s history, then all funds will be the same as nobody can predict what the price will be tomorrow. Using it or not or how to use it is each investor’s own decision, however a long, steady past performance isn’t just a thing of the past that we can forget about it.